But wounded, still. Feel it. of them, slick under fingers like warm wax. we perceive. We are remembering. Take that jaundice yellow patch, there. flat on his back. I think there was more rain. vulture wings. The turnpike moaned. like all of us, chained to time. Sam Cha received his MFA in poetry from UMass Boston. Before that, he studied at Williams, UVA, and Rutgers. He was the winner of the 2011 Academy of American Poets Prize at UMass Boston (judged by Marilyn Chin). Also of the 2012 Academy of American Poets Prize at UMass Boston (judged by Martha Collins). Also, he was one of the recipients of the 2011 &NOW Awards. 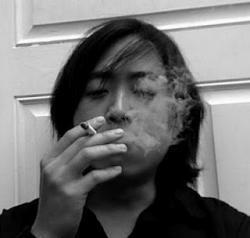 He's been published (poems, essays, translations) in apt, anderbo, Opium Online, decomP, Radius, ASIA, and Amethyst Arsenic, among other places. And his favorite kind of pie's a mud pie with a rope ladder baked into it---lockpicks and chisels on the side, hold the tin plates.